Shoal Bay West is one the prettiest beaches in Anguilla. Unlike its busier, stretched-out cousin, Shoal Bay East, Shoal Bay West feels quieter, and more intimate (though still a fairly large beach), as it forms a perfect semi-circle facing out to St. Martin. 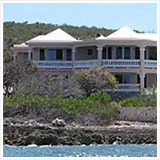 Some of the biggest celebrities make Shoal Bay West their home when visiting Anguilla. From Jay-Z to Denzel Washington, many stay at CoveCastles and Altamer villas, and dine at Trattoria Tramonto. 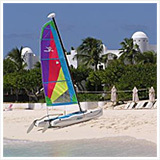 A special Anguilla hotel flies below the radar, nestled between all the five-star action. 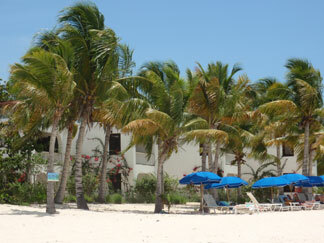 It is one of the island's best kept secrets... Blue Waters Beach Apartments. 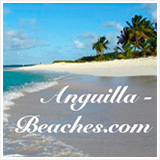 Ask anyone who has been visiting Anguilla for 15+ years, many of them love Blue Waters Beach Apartments to pieces. Our family never had the chance to stay at Blue Waters Beach Apartments, but our good friend Kristin Bourne's Mom and Step-Dad had the pleasure of trying Blue Waters in the off-season. 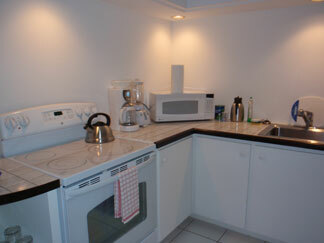 Blue Waters Beach Apartments was reviewed by Kristin Bourne. 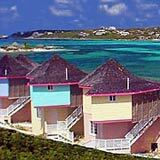 Clean, apartment-style units, right Shoal Bay West, Blue Waters Beach Apartments offers tremendous value. 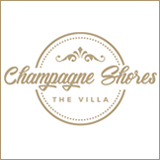 Right on sandy beach, with views of St. Martin in the distance, the location is five-star. The hotel rooms are big and comfortable. 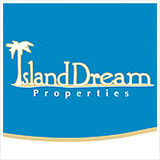 All is offered at extremely reasonable prices. 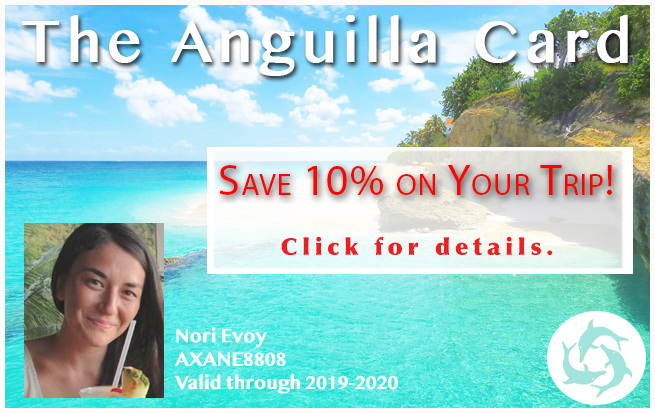 When you fall in love with Anguilla it's only fair to share the love! Once upon a time, I suggested my parents visit Anguilla with me. They promptly fell in love. Since then, they've come back twice without me (sadly!) and stayed at a couple different places. 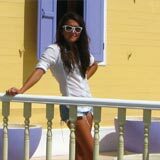 Their favorite Anguilla hotel? Blue Waters Beach Apartments on Shoal Bay West. Here's a list of their desires, which is why they chose Blue Waters in the first place. Their expectations were exceeded and they've found a place they continue to return to. 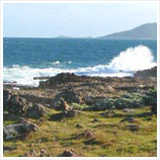 Blue Waters sits on Shoal Bay West, with unobstructed views of St. Martin and even Saba on a clear day. This beach is almost as far west as you can go on Anguilla, and the sun sets on the far side of the bay from where Blue Waters is located. So, you get a nice sunset glow from the Anguilla hotel. And, Anguilla has THE BEST sunsets! 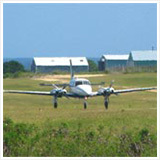 Getting to Shoal Bay West from the Valley, Blowing Point Ferry Terminal, and the Anguilla airport is a good 20 minute drive. I asked my Mom if they liked staying that far West, and if it was at all inconvenient. She said that it was a great location for them since many of the restaurants they love like da'Vida and Tasty's are situated centrally and west. She reminded me Anguilla is only 16 miles long (lest I forget!) and even if they took a day to explore the East, it was no big deal since the island isn't that big. If they didn't feel like venturing out, the very convenient and delicious restaurant Trattoria Tramonto is literally right next door to this Anguilla hotel. 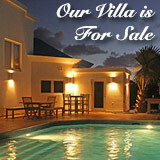 It is owned by Blue Waters owners' son-in-law and daughter and is often frequented by celebrities visiting Anguilla. How nice to just stroll over for a nice pasta or panini lunch right next door? I asked about noise from the restaurant making it's way over to the hotel. My mom, who has dog ears, could not ever hear a peep from the restaurant...not even the clinking of dishes. Tip: the grocery store, Foods Ninety-Five, is just up the road from Blue Waters in case you aren't in a explorative mood. First, they met up with the owner, Carolyn, in the office area in order to check in and get settled. Carolyn owns and runs Blue Waters. My Mom said when they were checking in that Carolyn wasn't overly concerned about such things that normally aren't so fun about check-ins. She made it all very smooth. She just sent them straight to their room, and said they'll settle up with the logistics later on. My parents thought she was so trusting to just let them be on their way to their Anguilla hotel room, allowing them some post-plane beach time (and time to unwind!) before dinner. My Mom went on, and on about Carolyn and how nice and hospitable she is. She truly wanted them to have a lovely experience. She went out of her way to make them feel comfortable and at home. She succeeeded! They chose a unit on the ground floor as the idea of walking right out on to the sand from you room was key for my mom. Their view was awe-inspiring (just like a commercial!) even from the bottom floor. My parents were extremely impressed with the room. It was very clean, fully equipped, nice and quiet, and they even had a phone and current phonebook. If you've been to the Caribbean before, you know how bugs can be part of your co-existance wherever you may go. But, not a single bug at Blue Waters! 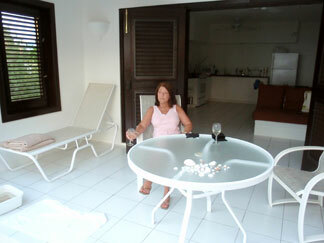 Carolyn runs a tight ship, and keeps a spotless Anguilla hotel. My Mom also noted that the bed was comfortable, drawing on her large area of knowledge. She knows beds since she is a traveling maniac (for work, not pleasure ;-)! 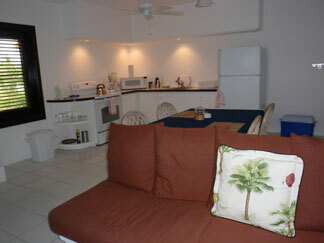 The kitchen was spacious and they enjoyed sitting at the kitchen table, gazing at the view of the sand and sea. My mom loved that the kitchen had everything they needed (even a blender! ), and it was all in great shape. The bathroom was also very spacious and again, super clean. I asked my Mom the hardest question I could, "What was your least favorite part of this Anguilla hotel?" She struggled to come up with an answer. She only commented on the sofa set up, which is more of a bench style seating area with cushions. But that wasn't really a problem. It was comfortable enough, and when they wanted to lounge they were doing it on the patio or beach, not inside, unless they were stretching out for a nap on the comfy bed. 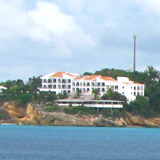 You can read more about the other Shoal Bay West Hotels, by clicking here. You'll find that they are more high-end and exclusive (and expensive!). My parents found their experience at Blue Waters to be unmatched, in terms of beauty and tranquility. My mom could not stress enough that they really felt like they had the place to themselves! 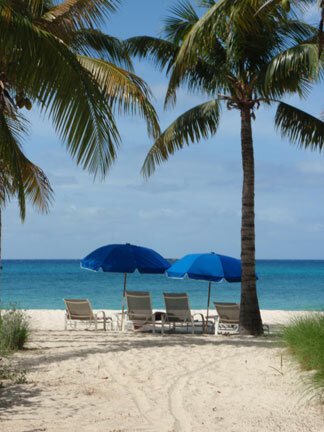 Note, they were in Anguilla in November which is not known to be the quietest time on the island either. They loved that "their" beach chairs just stayed put in the place they left them. No one was out there moving their stuff around or laying claim. It's like the place is truly all your own! Their privacy was incredible considering, how open they kept their unit. The design of the building allows for you to maintain great sea views but you aren't necessarily out in the open for others to see you, or you to see them. Brilliant! Another bonus of staying at Blue Waters is walking the beach. The water is a gorgeous blue, as you can expect from Anguilla. And with very few people around, it's like a giant clear blue pool just for you. There are also plenty of nice umbrellas and of course, palm trees, to shade you should you tire of the lovely rays of sunshine. The end of the beach that Blue Waters sits on offers gentle wading, relaxing swimming, easy strolling, and fun exploration and shelling. Who needs a chlorine-filled, concrete pool when you have all of that at your toes?! Return to Blue Waters Anguilla Hotel? YES! 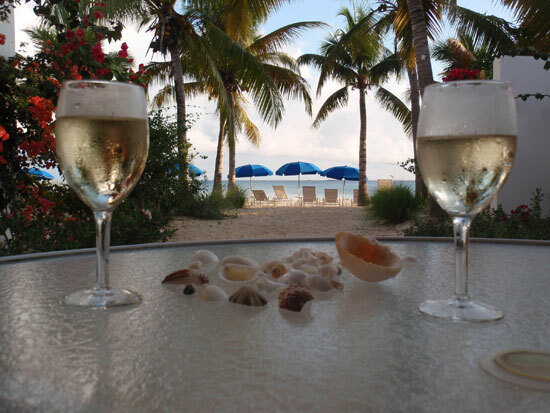 Silky white sand, clear blue water, gracious hostess, clean and quiet rooms, vistas framed by colorful flowers, and lush palm trees... All of this is found at Blue Waters Beach Apartments. It's easy to understand why you might want to visit Blue Waters again! It seems as though the people who have discovered Blue Waters continue to come back. Since it's is not a sprawling, huge hotel, it's wise to book in advance as Carolyn's reservation books stay filled.